“Whoever dwells in the shelter of the Most High will rest in the shadow of the Almighty” (Psalm 91:1). Last year we introduced you to the Calix family. Santos, the family’s patriarch, works on a farm that provides coffee beans for us. This Honduran family received a pila (water storage unit) and bathroom last year through HOPE Coffee. Receiving running water for the first time in their lives, they were overjoyed and grateful for the blessing of water. However, they continued to live in a mud-walled and mud-floored, one-bedroom home. All 14 of them—the mother, the father, and 12 children from ages 2 to 15—made due without complaint in this quite cozy accommodation. HOPE Coffee has now partnered with Iglesia Betel (Bethel Church, in Siguatepeque, Honduras) and a children-at-risk ministry known as Prodim to build the Calix family a home. Its walls have already been built, and the roof was completed on May 30th! We rejoice in the provision of Christ through many of you who have supported HOPE Coffee through your purchases. We also thank the Lord for the construction workers, Cristian and Junior, who labor diligently. 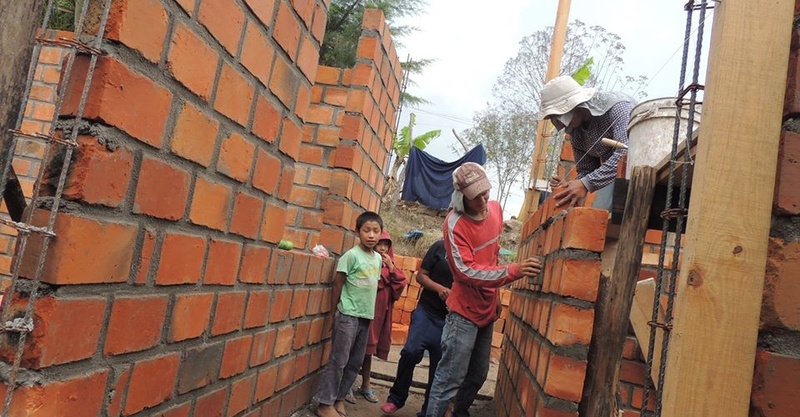 As they finish construction of the Calix’s home, join us in praying that they would find their eternal shelter in Christ as they do not yet know Him. May the temporary home they build for the Calix family point them towards the eternal shelter found in Christ—a shelter that provides the protection and rest that satisfies the soul. Only through Him can we experience the security of our souls and the hope of everlasting life.